The Cumberland Plateau of north Alabama is one of the more scenic and ecologically important regions of the state. The region consists of sandstone plateaus and ridges with carved limestone, shale and dolomite canyons and valleys. Sixty one percent of the region is forested with Loblolly-Shortleaf Pine, Oak-Hickory, and Oak-Pine types. The pines typically remain in areas where periodic disturbances of fire occur particularly on the drier upland sites however where fire has purposely been excluded they have succeeded into oak-hickory stands. 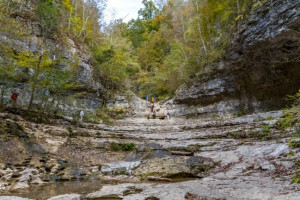 Forests in the Cumberland Plateau play an important role to the area ecologically, socially and economically. The state of Alabama ranks fifth in the nation and is first east of the Mississippi River in species diversity, including one-hundred forty-four species found nowhere else on earth. It also ranks fourth in the nation of species at risk of extinction. In the Cumberland Plateau region of Alabama, which makes up fifteen percent of the state, there are fifty five species federally listed as endangered, including the Red Cockaded Woodpecker, Cahaba Shiner and Green Pitcher Plant. There are also fifteen listed as threatened and six candidate species under review for listing. Nonnative invasive species have a significant impact on species at risk and the Cumberland Plateau region is susceptible to many including Chinese Privet, Mimosa, and Kudzu. The region offers many recreational opportunities through federal and state lands like the Bankhead National Forest and within it the first federally designated wilderness east of the Mississippi, Little River Canyon National Preserve with the only river that forms and flows near entirely on the mountain, and the Walls of Jericho, known as the Grand Canyon of the South, and one of many tracts owned by Alabama’s Forever Wild Land Trust. 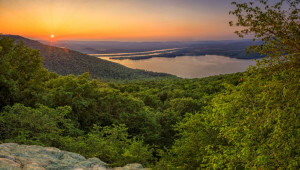 Other important areas include the Black Warrior Wildlife Management Area, Wheeler National Wildlife Refuge, Skyline Wildlife Management Area, and Lake Guntersville State Park. These areas are more attractive, productive and easily managed when adjacent private lands are also managed in a sustainable manner. The forest products industry in the Plateau counties employ over twenty-eight thousand workers manufacturing lumber, oriented strand board, packaging, pilings and poles. These mills and associated businesses generate nearly one hundred thirty eight million in taxes and account for two and one half percent of the region’s total workforce so many of the region’s communities and families are dependent on healthy working forests. The American Forest Foundation and its partners will complete three landowner marketing campaign beginning in the winter of 2015 and over two years will continue to engage family forest owners in sustainable forest management with an emphasis on riparian forest improvements, prescribed fire and shortleaf pine management. Once engaged, landowners will receive offers for additional information, site visits from professional foresters and wildlife biologists. Landowners accepting one of these offers will receive monthly email communications with educational information and promotions to landowner events and other opportunities like cost-share. Landowners will receive invitations to at least three technical education programs and three landowner field days. The Foundation’s partners include: Alabama Forestry Commission, Alabama Forestry Association, Alabama Treasure Forest Association, Alabama Department of Conservation and Natural Resources, Auburn University School of Forestry and Wildlife Sciences, Alabama Cooperative Extension System, American Forest Foundation, Natural Resource Conservation Service. Cumberland project partners will work with landowners to restore over 1,000 acres of shortleaf pine, enhance over 2,500 acres of shortleaf habitat, and engage 600 private landowners through technical assistance improving economic, recreational and ecological values of the region.